Every Sunday, we gather as a community at The Perkins Centre to worship God through fellowship, music, service and studying the Bible. Coffee and other drinks are at the ready at 10:00 a.m. (and maybe even some treats if someone's feeling ambitious). People amble in, grab a drink, and spend some time catching up with each other and meeting new people. At around 10:30, we gather around tables for a time of singing, praying and reflecting on God's word, the Bible. This time of worship is led by various members of New Hope Church. On some Sundays, we spend our time together worshiping by serving our community in some way. Usually this means we work on a project together that will benefit our neighbourhood or a community organization. We have childcare available during these gathering times for children under 3. For the other children, we have Sunday School during part of the service on most Sundays, or we set up craft tables amongst us where the kids can create. If you ever want to get a better idea of what's planned for an upcoming Sunday, you can check New Hope's Facebook group or the church calendar. 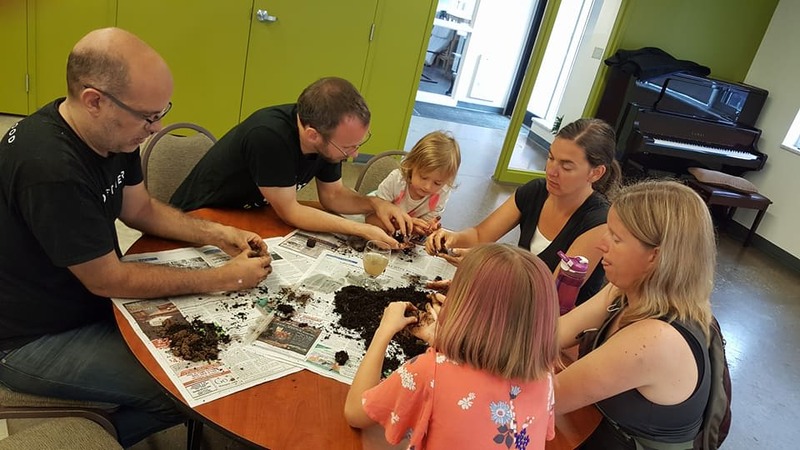 This busy group is making "seed bombs" which will be used to plant native species in some of the parkland in Hamilton's watershed areas: just one of the many activities we might do together on a Sunday morning.